12 months ago, I had this idea to bridge a bit of a gap and form ‘The Handover’. A monthly collection of posts from around the EMS blogosphere that have been submitted by those of us out here who choose to share their experiences of the roller coaster ride that is known as EMS. This months edition, and the 1st anniversary was hosted by Buckman over at www.gomerville.com. He asked us to think of an inspirational character who helped shape or guide us in our EMS careers, and some of my favourite writers have taken the time to share some very personal stories. Click here to read this months edition, and if you so wish, let others know about it too. 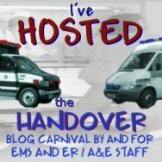 I know that there are more and more new EMS Blogs cropping up each and every week, and I know that quite a few of you new bloggers read my little blog too. Numbers of submissions have been dwindling a little lately, so please consider submitting a post to the Handover if the topic appeals to you and your thoughts. The Handover will only survive with the support of EMS bloggers out there in the big ol Blogosphere! Hi Mark,What's the format for submitting a post for the Handover?